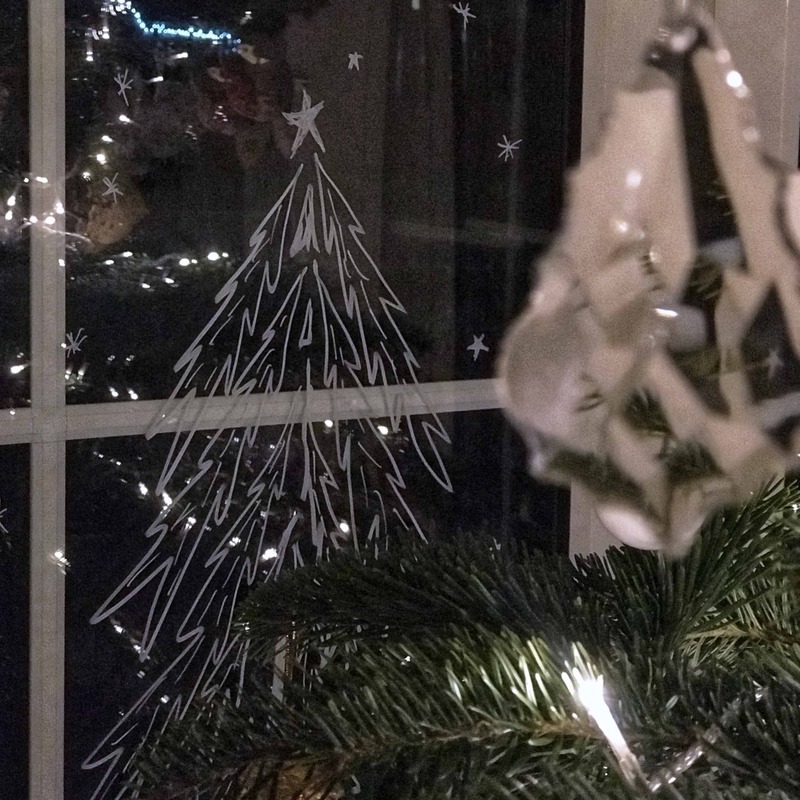 I’ve decorated our bay window for Christmas with chalk pens. It was so quick and easy to do, and I’m pleased with how it turned out. 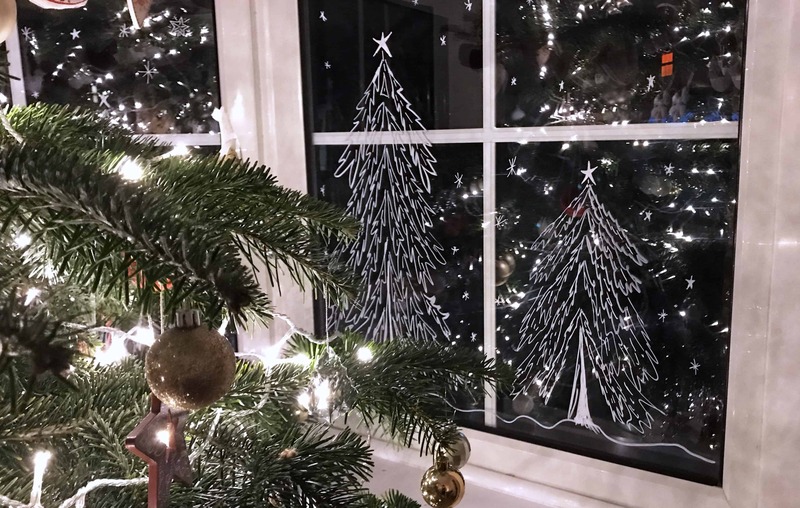 Here is my guide to using chalk pens to decorate your windows for Christmas. All you need to buy is one or more chalk pens. 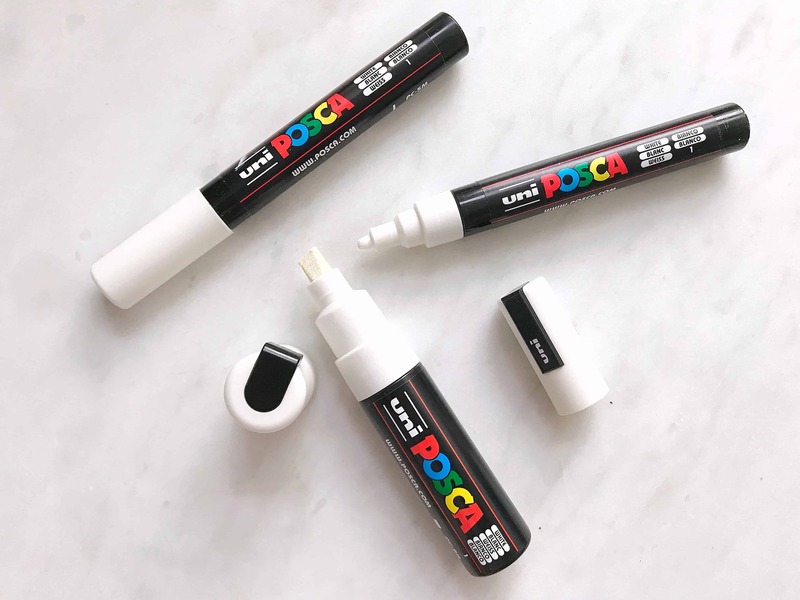 I did a bit of research before I started, and these Uni Posca Chalk Pens have great reviews. They come in a variety of different nib widths and styles, and I bought a pack of three Posca White Paint Markers with 2.5mm nibs for around £5, and you can find them through this affiliate link. I also got a chisel tip white chalk pen for around £4 through this affiliate link, but it would have worked fine with just the narrower ones. Clean your windows before you begin, and make sure they are dry. Prime your pen by shaking it up, and pressing the nib down onto a piece of paper until you can see the ink flowing through. 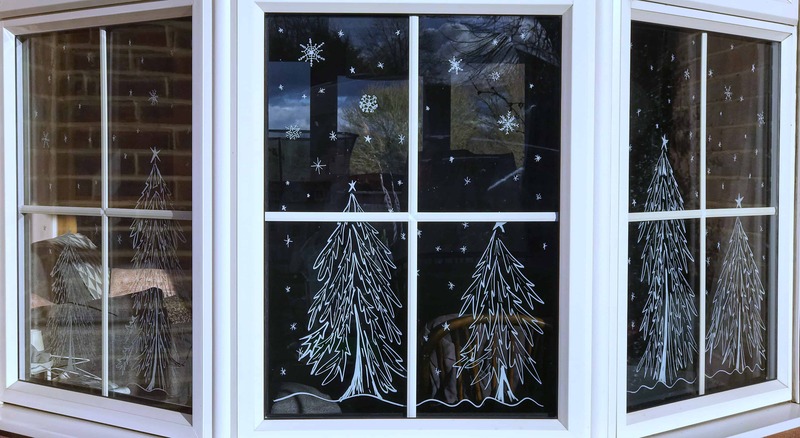 Then simply draw your chosen design onto your windows. I started with a few snowflakes and stars. It takes a bit of practice to get used to drawing on a vertical surface, especially as it’s slippery! But don’t worry if it goes wrong, just wipe it off and start again. Once the chalk pen is dry, it stays on really well, but is easy to remove with a damp cloth. After a few snowflakes, I soon got a bit more ambitious. 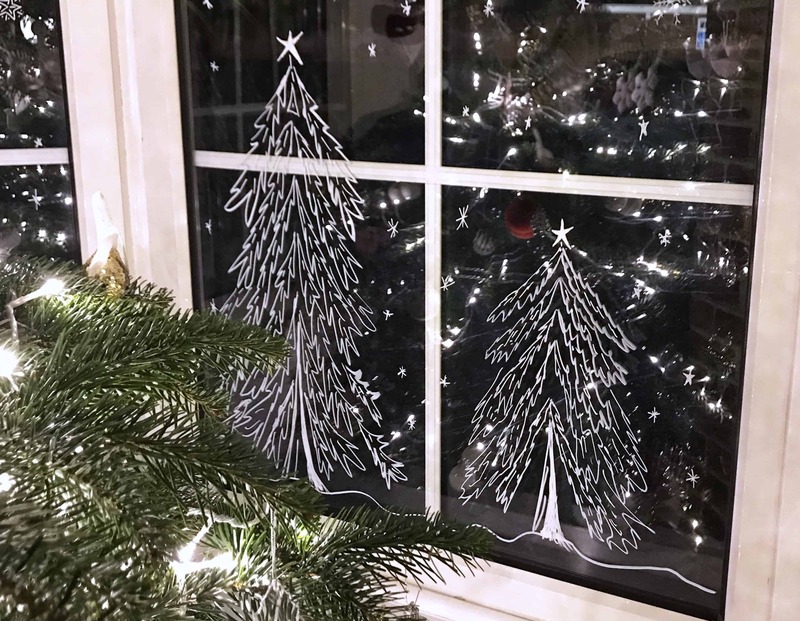 I drew a small forest along the bay window where our Christmas tree sits. It looks nice from the outside, even if the tree covers most of it from the inside. 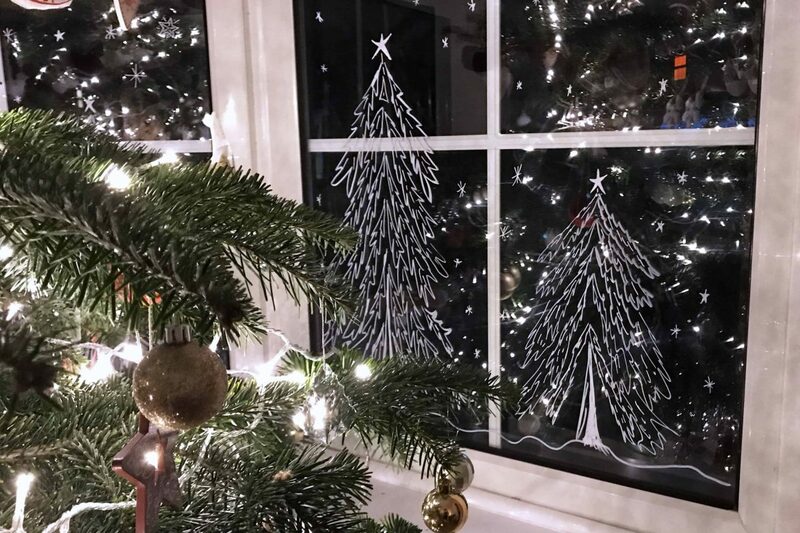 This is how my chalk pen window decorations look from the outside. 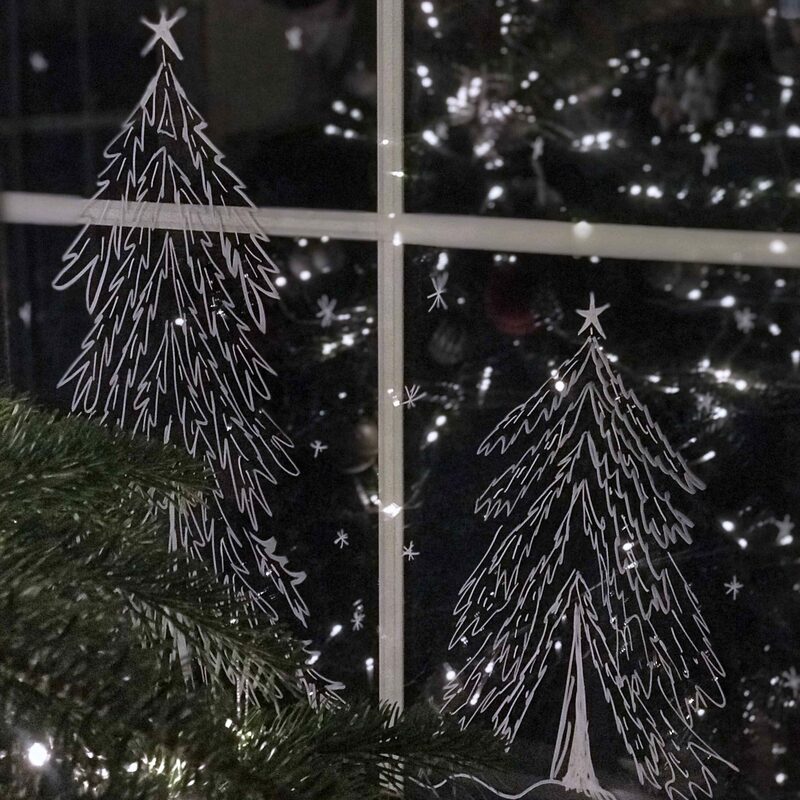 The chalk pen decorations look great now the Christmas tree is up too, as the lights reflect, making it look a bit magical. Don’t worry if you’re not confident drawing free-hand. Just find some nice images online, and print them off. 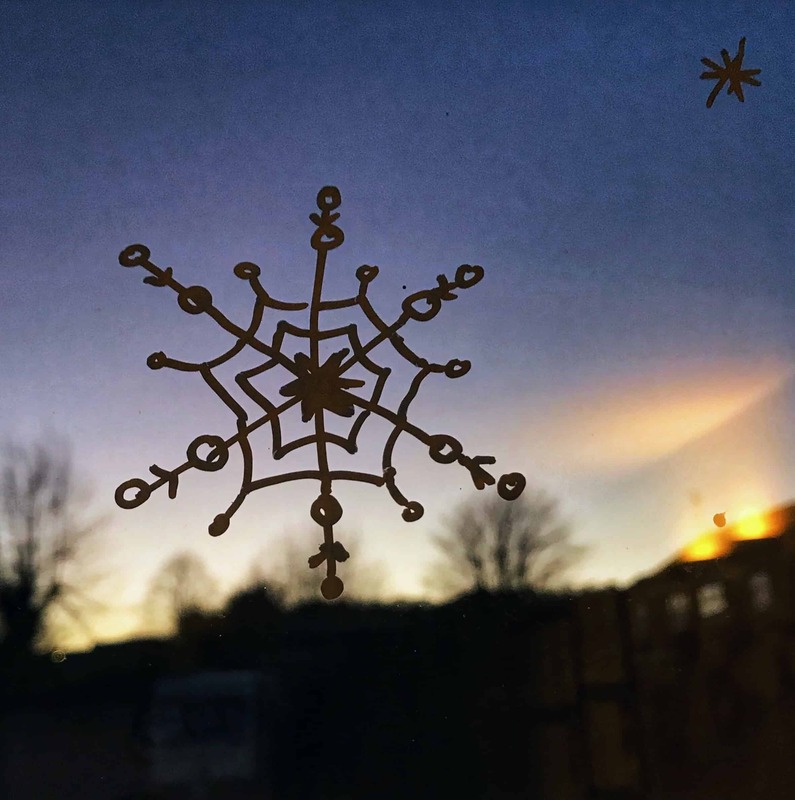 Tape them on the outside of your windows, facing inwards, and trace over the design. I’d definitely recommend that option if you want to add words to your window design, to be read from the outside of your house. It would make it much easier to write backwards! 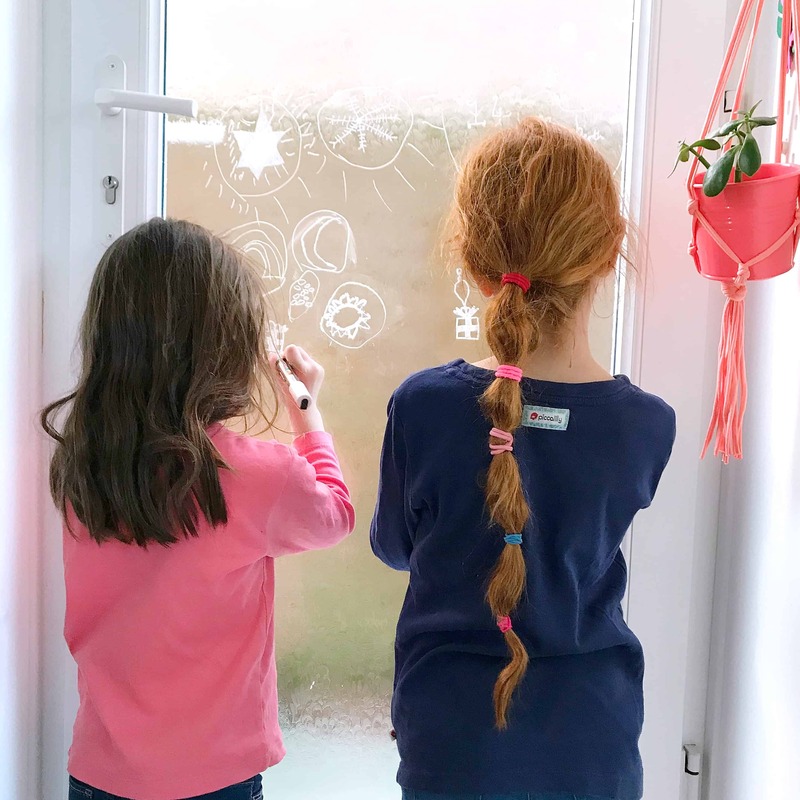 It’s really good fun, and I let Ava and Thea loose on our kitchen door, which they loved. It’s great to let the kids unleash their creativity, isn’t it? Ha ha. 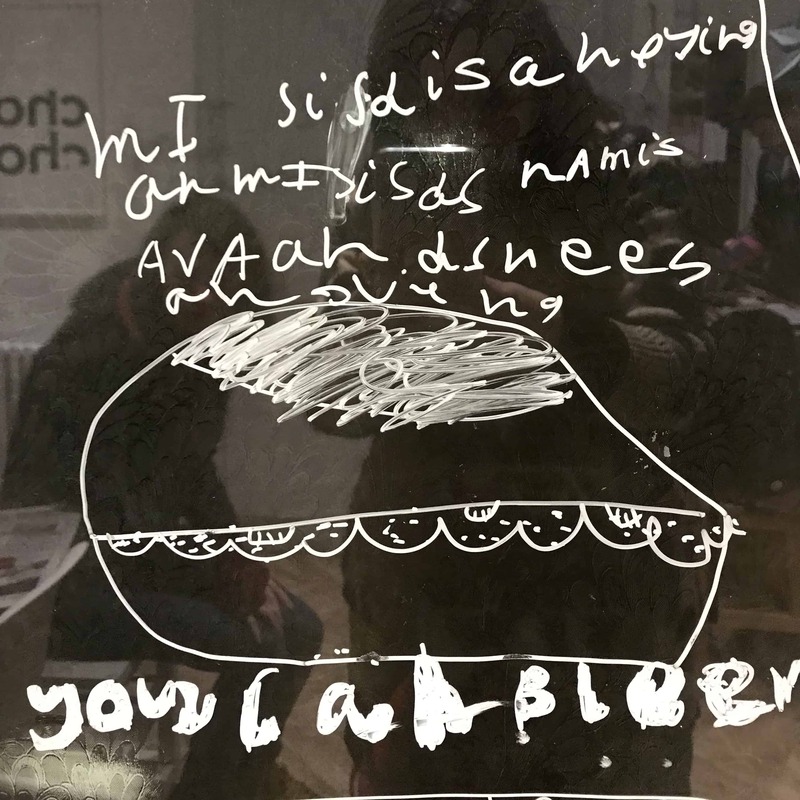 If you want to see more creative kids activities, you’ll love Ava’s creative kids party! 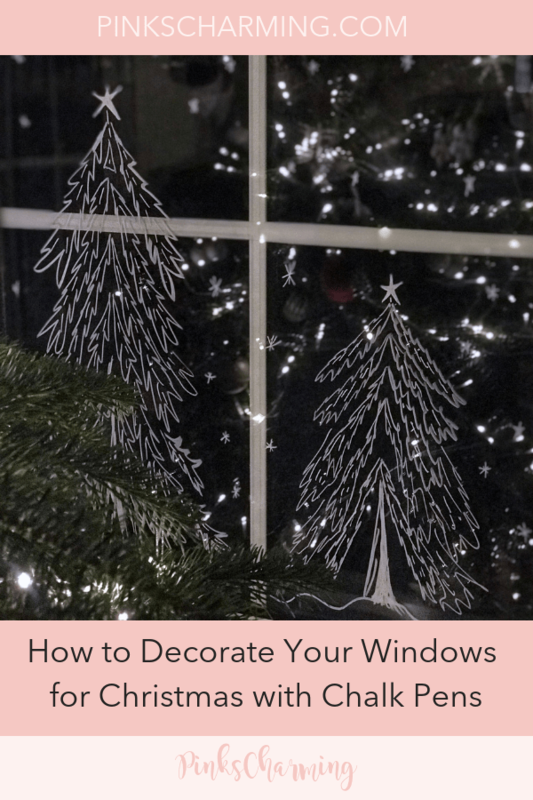 I hope you’ve found my guide to decorating your windows with chalk pens, why not Pin it for later? I so wish I had done this this year. I was looking everywhere for some nice window stickers but couldn’t find any I liked. Never occurred to me to simply buy pens and do our own drawings. Next year I’ll definitely do this. The girls would love it. They look beautiful Becky – what a great idea and fun to do. Have a great Christmas! I absolutely love Posca pens, we take them on holiday with us. Not to draw on windows obviously. 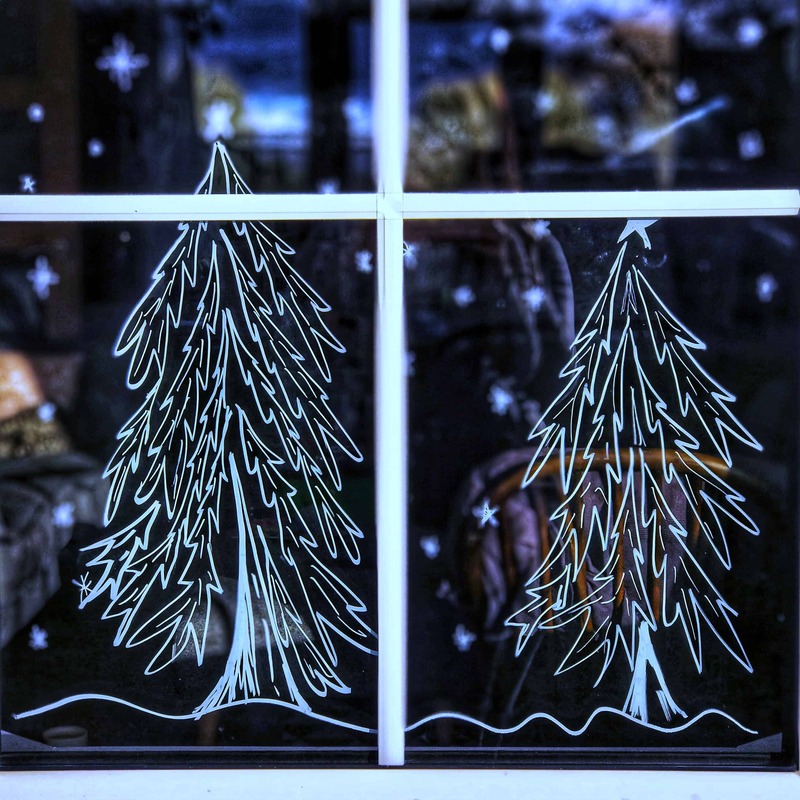 Although your windows are outstanding – I love the shape of the trees you drew. We use them to have an art session on our sun beds collecting shells and stones. We then put most ofthem back on the beach and the odd one or two come home with us. They’ve kept me and my 6yo old happy for hours.